Acompanhe um novo depoimento da aventura sobre moto do colaborador de MotoMovimento John Nomad pela construção de uma academia de ginástica para crianças carentes da Zâmbia, na África. Frio, neve, chuva e ventos intensos mas também muita solidariedade no caminho para a Rússia. 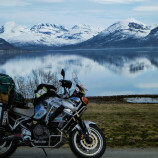 I am looking at the bike’s odometer and it tells me I have done 6600 km from Bruges and 3500 km from Trondheim, Norway where I posted my last blog post. I am in a quaint village close to Helsinki, resting at a friend’s house (thank you Jan for your generosity and friendship, it saved my life). All my gear is soaked, muddy and I am exhausted and on the verge of collapse. The past 2 weeks have been the most challenging of the entire expedition so far. With the exception of few glorious hours of sunshine here and there, I rode the bike through the worst weather I could have imagined: high winds (highest at Nordkapp, 20m/s), low temperatures (1 Degree Celsius) and snow, icy roads and then rain all the way to Southern Finland. I left Trondheim in heavy clouds, heading north to Mosjoen. The road was straighter and the riding was not difficult, except that it rained on me the whole day. The camp in Mosjoen was lonely but they had good facilities and I made sure I used their warm kitchen where I cooked and dried my clothes. It is amazing how your spirits are lifted up when you cook a warm meal and rest in a dry environment. 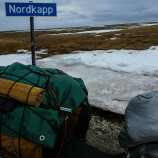 This would be my second last haven of warmth and while I didn’t know about it, I had a sense that Nordkapp will not let me conquer it without putting up a fight. As I headed north to Narvik, I passed the Arctic Circle on top of a mountain. The day was miserable, of course, low clouds, wind and 3 degrees. The Center at the Arctic Circle was open but empty, no visitors, as the girl at the counter told me that this is too early in the season for visitors. I got that from several other people who told me I am crazy to attempt Nordkapp this time of the year. 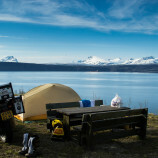 Narvik Camp was closed so I camped wild (in Norway and most of Scandinavia you are allowed to camp virtually anywhere where there are no farms, plantations or private properties, it is called the Right of Access), on top of a hill overlooking the Narvik Fjord. It was a quiet night and I needed to rest, as the next day I was heading for Alta, my last stop before Nordkapp. I was already riding 500 km per day, which is nothing if you are riding in Namibia (where I rode 1300 km in one day, because the roads are straight, virtually no traffic and very little population), but not in Norway, where the speed limit is rarely 80km/h and the roads are winding around the high mountains. As I headed to Alta the landscape changed to round-top mountains and more snow. It was becoming very desolate, with fewer villages and less trees. I felt I was riding in Nunavut, Canada and I shook my head, suddenly realizing what is waiting for me. When I arrived in Alta, rain started, yet again, but I was already set with my tarp over my tent so I was dry, fortunately. It rained most of the night and the next day and while I was cooking, the lady from the camp came and told me that I could stay in a cabin without extra charge. She must have seen in me a suffering soul and felt pity… I was surprised that a Norwegian would offer me something without money (no disrespect intended, but Norwegians should join Planet Earth and have prices that can actually be reasonable: I paid 1 Euro for 1 Egg in Mosjoen in a grocery store, where I paid 1.09 Euros for 10 eggs in Rovaniemi, Finland. 5 Euro for a loaf of bread is unreasonable in my humble opinion, and over 2 Euro for a liter of petrol in a country that has immense oil reserves, seems to me a “little” ridiculous), but as I talked to her, I found out she was Finnish. Aaaah! God bless the Finnish! No wonder she talked to me, as throughout all my traveling through Norway, for 3 weeks and over 3000 km, only 4 people talked to me and were curious about my journey. 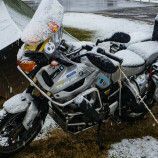 I woke up the next morning in a snow blizzard, 1 degree Celsius and close to 10 cm of snow weighing heavily on my tarp and covering my bike. Nordkapp was showing its teeth, as I had only 240 km to go to complete this quest. 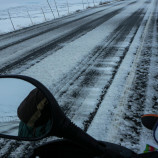 I waited one more night and the next morning, May 23rd at 6:00 am I left Alta and headed for Nordkapp. The road took me through a mountain pass and it was dry, but as I climbed the mountain, just rounding a peak, I hit ice on the road, blown by the heavy wind on top of the mountain. I didn’t have much speed, I think less than 60 km/h, but I came on the ice too suddenly and I started skidding towards the left side of the road pushed also by the wind. I was screaming in the helmet on my own and I used engine breaking to reduce the speed but the bike being so heavy it was heading dangerously towards the cliff. I put both my feet on the ground to maintain stability so I don’t tip over and I spotted a large snow pile and I headed straight for it. I thought it might be better in the snow than at the bottom of that cliff. I hit the snow pile hard, ice flying everywhere but I stopped and I was happy to be alive. The road was very lonely that morning, it was cold and I was frozen stiff. I couldn’t push the bike, of course, and I dug around it as much as I could and I jumped on it and I did what I thought it would be the best choice: I opened up the throttle and let it rip hard into the snow. My amazing bike (which has never seen so much snow and ice in her life) and my amazing Heidenau K60 tires pulled me out of the frozen snow that morning and back on the road. The rest of the mountain pass was done very slowly, 20 km/h with both feet down until I reached the valley below and I stopped on the side of the road to control my shaking (whether it was from the cold or from the idea that I could have died frozen up there, I don’t really know). 160 km to go to Nordkapp and I seriously thought it might not happen anymore. 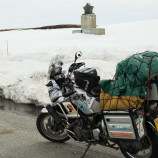 To come 25.000 km from Africa with this in mind and stop short of Nordkapp was a genuine possibility at this stage. After a few minutes, I breathed deeply and I jumped back on the bike, decided that I would take a kilometer at a time and see what happens. The wind was increasing, blowing from the right side hard; my hands were numb and I felt very cold down my spine. The thermometer indicated 1 degree still, but I was sure that the wind-chill factor at this temperature would be way worse than I expected. 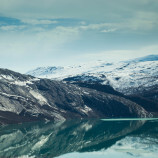 As I turned north at Olderfjord, it started to drizzle, some sort of frozen rain, making the road extremely slippery. On the way to Honingsvag, the road is built right on the side of the sea, with high cliffs on the left and the churning Arctic Ocean on the right. Few kilometers outside Honingsvag I entered the Nordkapp tunnel, a 7 km tunnel that goes 5 km under the sea to reach the final stretch to Nordkapp. The tunnel was freakishly dark, I had to pull out my goggles to be able to ride and it was very cold in that darkness. No cars, no traffic and my state of mind suddenly took a turn for the worse; deep depression set in, I started shaking uncontrollably again and I turned the bike around inside the tunnel and stopped. I had 32 km to Nordkapp this way, or 240 to the Finland border that way, where straight roads, friendlier people and warmer temperatures would welcome me. I starred in both directions inside that tunnel and the darkness starred back inside of me. It was a very natural decision to quit, it felt easy and unremorseful. 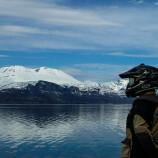 I jumped on the bike, started it and as I put it in first gear, the deep rebellion in me woke up and said: “Screw this! Screw natural tendencies and easy decision making! Today, I go against myself, against my mind and against my will!” I turned the bike around and headed to Honingsvag and Nordkapp. After passing Honingsvag, the road becomes very narrow (3-4 m wide) and climbs higher to reach the Cape. There are no more trees, the wind is unrestricted and it was blowing me off the road into the cliffs that were dropping on each side. I grinded my teeth like never before, hating the rebel inside me and promising I would never listen again to its idiocy. Nordkapp was now only 9 km in front of me. I grinded some more and I leaned harder on the right side to counteract the wind power. I asked him to go inside, but then I realized that I have to pay to reach the building. When he told me I have to pay 25 Euros to pass, I looked at him, deeply and I thought: “If I jump on his neck and strangle him, it wouldn’t help much. He is just working here.” I told him with a very frozen smile: “I will just turn around”. I did a U-turn and rode 100m down to the Nordkapp sign where I said I should at least take a photo. I climbed off the bike and as I put the foot peg down the wind almost toppled the bike on the side. I couldn’t get away from it to take a picture. The photo you will see of the Nordkapp and a part of my bike was taken while I was pushing the bike with all my power with one leg, against the wind, while I stretched backwards to be able to take the bloody photo. It was extremely disappointing to go through so much hell to get there and to be stuck at the sign, by myself and not being able to document it properly. In retrospect, I don’t care anymore, Nordkapp was mostly a symbolic feat for me, as the place itself is not that spectacular; it is a rock on a top of a ridge. As I found out later, it is not even the northernmost point of Europe, the real one cannot be reached by car or road, as you have to hike for about 8 hours to get there. For me though, it was the conquering of my own fears, tendencies, weaknesses and doubts and that is why Nordkapp will always be important to me. It brought out the inner struggle and helped me understand how fragile us humans are and how we can also find strength to push our limits further. I rode 4 more hours that day, even though I was frozen and wet and as I headed south towards Karasjok, I found the road challenges very feeble in comparison to what I just witnessed. The next day I entered Finland, where the roads are straight, the speed limit 100 km/h, the people friendly and the prices reasonable. I was still shaken from the day before, but I was feeling invigorated and had a deep sense of peace and tranquility in my heart. Nordkapp was on the top of my list since 2011 when I started to plan for this expedition. Our major direction from Livingstone was North. North to Nordkapp of course. Reaching it implied serious shift in physical direction (I would now head south to Turku, Finland and then East for the next 11.000 km to Vladivostok, Russia) and in my mental attitude as well. Now, Mother Russia awaits for me, with its humongous distances and cultures and secrets. When I entered northern Finland and saw the first signs for Murmansk, the hair on my neck stood up. I need few days to recover from Nordkapp trauma and set my mind for Russia. On my way down, I stayed in Jan’s friends’ homes, Mr. Eero and Mr. Rogers, excellent gentlemen that opened the doors for a stranger like me. It felt very weird to sleep in a bed, eat some amazing food, and chat with these people. Even though I was coming out of one of the top countries in the world, I felt I was coming out of the Amazon Jungle (where I have spent some time in the past). It was the same feeling because of the loneliness I endured in that country and the challenge of riding through its mountains and fjords. Norway will forever bear its print in my soul and my subconscious… It is with mixed feelings that I declare that, truly, this is a paradise country to ride your bike in, even though it will hurt your wallet, your heart and your mind; but if you make it, you will become a stronger person inside and out, just like the Vikings of Norway are. Este post foi publicado em + Colaborador, + Comunidade e recebeu as tags John Nomad, Motomovimento, solidariedade sobre motos. Guarde o link permanente.